Query of all available medical databases of both state employees and private medical personnel within the greater Cape Town area to determine current staffing levels and distribution of personnel across public and private domains. Analysis of the adequacy of available staff to manage a mass casualty incident. There are 594 advanced pre-hospital personnel in Cape Town (17/100,000 population) and 142 basic pre-hospital personnel (4.6/100,000). The total number of hospital and clinic-based medical practitioners is 3097 (88.6/100,000), consisting of 1914 general physicians; 54.7/100,000 and 1183 specialist physicians; 33.8/100,000. Vacancy rates for all medical practitioners range from 23.5% to 25.5%. 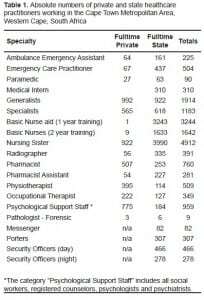 This includes: nursing post vacancies (26%), basic emergency care practitioners (39.3%), advanced emergency care personnel (66.8%), pharmacy assistants (42.6%), and pharmacists (33.1%). There are sufficient numbers and types of personnel to provide the expected ordinary healthcare needs at mass gathering sites in Cape Town; however, qualified staff are likely insufficient to manage a concurrent mass casualty event. Considering that adequate correctly skilled and trained staff form the backbone of disaster surge capacity, it appears that Cape Town is currently under resourced to manage a mass casualty event. With the increasing size and frequency of mass gathering events worldwide, adequate disaster surge capacity is an issue of global relevance. Historically Cape Town has hosted large one-time events such as the 1995 Rugby World Cup, the 1996 African Cup of Nations and the 2003 Cricket World Cup. In excess of 450,000 football-specific overseas visitors are expected in South Africa for the World Cup, in addition to the regular 300,000 tourists.4 An excess of 150,000 visitors are projected to be in Cape Town alone. The Western Cape region is thus uniquely poised to test its disaster preparedness and the special challenges that large, culturally diverse, multi-lingual international crowds demand. The potential for a planned mass gathering escalating to a mass casualty incident (MCI), raises the following question: Does Cape Town have adequate resources to meet ordinary patient care needs the increased requirements linked to mass gatherings expected in June 2010 for the Football World Cup, but also for a large casualty-producing incident should it occur? Most disaster planning is performed at institutional or organizational levels with little collaboration between organizations, especially public and private providers. Specific objectives of this study are to assess the combined current medical staffing levels within the Hospital Referral System in the City of Cape Town Metropolitan Municipality, South Africa, within both private and state healthcare sectors, as a basis for determining whether current resources are adequate to manage a conventional mass casualty incident. Using Pivot tables in Microsoft® Excel, investigators queried all available medical databases of state employees and private medical personnel within the greater Cape Town area to determine current staffing levels and distribution of personnel across public and private domains. The Human Resource, Personnel and Salary (PERSAL) system is used by the Provincial Government of the Western Cape to register and pay employees.9 It allows for data retrieval on salaried state-employed staff by institution and category, as well as salary level. Part-time and seasonal employees were excluded, while Department of Health contract and permanent workers were included. Qualifications are only recorded for about 10% of all employees. The database was extracted from the PERSAL system on October 15, 2008. 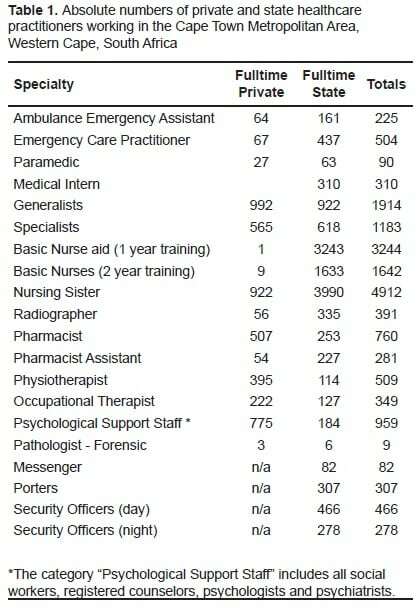 Analysis revealed 48 categories of staff, with similar functions grouped under the same heading. Pharmacists of all types were grouped in one category, while pharmacy assistants were categorized separately due to need for supervision. Two additional sources were examined to determine the ancillary services within the state and medical personnel in private services. The Risk Management Division of the Provincial Government of the Western Cape was used to determine the number of outsourced security personnel available in healthcare facilities during both day and night shifts. We used the MEDpages database to obtain data on private practitioners, combined with locum agencies in Cape Town. This study was approved by the local institutional review committee. Personnel in Cape Town available for first response and patient transport during a disaster are 17/100,000 population emergency care practitioners and 4.6/100,000 pre-hospital providers (Table 1). The overall number of medical personnel currently available is 88.6/100,000 population. This number excludes interns, as they are regarded as still being in training, and aggregates all other medical practitioners except psychiatrists. Of the total, general practitioners represent 54.7/100,000 population, incorporating all medical practitioners who are not registered as specialists in a surgical discipline or who are able to provide healthcare during a disaster. By definition, this group includes physicians with varying expertise, capable of providing non-surgical assistance ranging from triage and basic healthcare/first aid to more advanced medical stabilization and interventions. The number of registered specialists is 33.8/100,000 population. This number includes registrars (senior residents), and aggregates all medical and surgical specialists, excluding psychiatrists, dermatologists and dentists, as well as those specialists “boarding” on non-specialist posts who hold an equivalent registration. Vacancy rates for healthcare providers are available only for the public sector. For all medical practitioners, irrespective of qualifications, these lie between 23.5% and 25.5%, equaling that of all nursing posts at 26% (Table 2). The psychological support staff category includes social workers, registered counselors, psychologists and psychiatrists who provide immediate support including reuniting families. There are 775 private and 184 state employees (total 959), or 27.4/100,000 population. Eighty-one percent of security services are outsourced. There are currently no “disaster clauses” in the contracts with security services or catering companies. No data are available these essential support personnel for private facilities. Limited numbers of ventilated and non-ventilated (“high care”) beds exist in Cape Town (Table 3), which provides insight into the staffing needed per level of care. “At the heart of each and every health system, the workforce is central in advancing health.”10 The issues facing the system in South Africa are common to many parts of the world. Healthcare systems are strained on a daily basis and disaster planning is relegated below more urgent needs. In addition, the misconception that surge capacity can be equated with “bed capacity” remains pervasive. In many cases, the normal patient volume will still present to clinics and hospitals despite a major disaster. A review of the case mix presenting to emergency departments (ED) in Cape Town showed that the majority of patients self-presented11 and would therefore not readily be diverted elsewhere during a disaster. The latest census (February 2007), of Cape Town showed a population of 3.497 million12, with an annual national growth rate of 0.8%.13 Compared to 2001, the Western Cape showed a 16.7% increase, vs. a national average of 8.26% increase for the same time period.14 Of the population of the Western Cape, 66.3% live within the City of Cape Town Metropolitan Municipality.15 This results in a disproportionate burden on service delivery, including infrastructure, social services and in particular healthcare delivery. This disproportionate spending also drives approximately 73% of general practitioners and 75% of specialists to work in the private sector, while only 41% of the nursing staff do.21 As most of these physicians are in solo or small group practice, they are generally not connected with disaster planning. A number of actions can be taken to manage a catastrophic surge. These include discharging stable ED and inpatients, cancelling elective surgeries, opening alternate care areas, and calling in standby or off-duty staff. For such a system to work effectively, a clear plan must define who has authority to initiate such a cascade. In addition, the trigger points that activate these costly measures should be specified. The activation of a local or regional disaster plan may have residual health service delivery implications for days or longer. These measures, however, have not been rigorously investigated or consistently implemented in all patient populations. Hospital beds and staff are already routinely saturated to care for the sickest patients. Therefore, there are no additional staff to mobilize. During catastrophic surges, authorities often rely on the assistance of the national armed forces, whether as part of the search and rescue phases, or by providing logistical support or medical care. The UEFA EURO 2008™ football cup illustrated the pre-emptive use of the armed forces to provide security and medical staff.23 While legislative authority exists, this option is not feasible in South Africa, 24 despite having two large military medical facilities (2-MIL and IMM), in part due to personnel shortages.25,26 South Africa also lacks a federally organized civil protection organization that could provide the framework for such a response. The U.S. National Disaster Medical System projections range from 100 – 600 patients/million population for traumatic disasters. The Israeli military defines adequate surge capacity during peacetime for an unspecified threat as being able to augment patient care capacity, including staffed beds in existing hospitals, by 20%.28 It is unclear whether these extrapolations can be applied to the system in South Africa. Healthcare worker absentee rates can severely disable disaster response. One survey predicted absentee rates of 14% in the case of a mass casualty incident, which increased to 40 – 50% in an infectious disease outbreak.29,30 Fear and concern for family (almost half of the respondents) and fear and concern for self (almost one-third of respondents) were the most frequently cited reasons for being unwilling to report to work in one large U.S. study,30 factors echoed in a Canadian study.31These are, however, theoretical rates, as these studies do not account for actual behavior during a disaster. Pre-event education and provision of care sites for families and pets may substantially improve response rates. Only seven state hospitals (limited 24-hour operating room capacity) and nine community health centers (no operating room capacity) have EDs equipped and staffed to manage trauma patients. These centers are usually staffed by the most inexperienced personnel (community service medical officers) and there is no immediate access to senior clinicians.32,34,35 This is due to a flattening of the pyramid of expertise, whereby a large number of junior personnel function at primary and regional levels and faculty are concentrated at academic centers. In addition, many posts are vacant, some having been frozen or abolished. 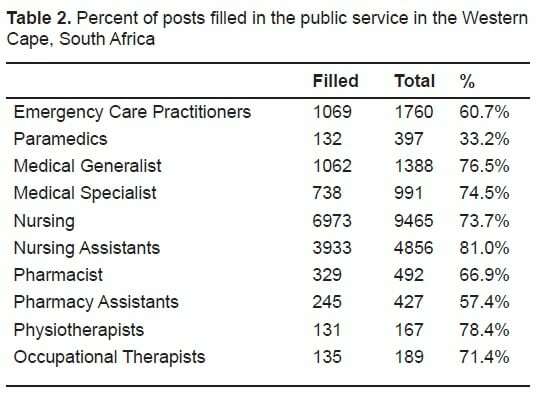 As compared to previously published figures suggesting that the Western Cape has the highest level of medical personnel resources, with 147 doctors/100,000 34, the findings of this study of a combined public/private medical practitioner number of 83.7/100,000 seems low. However, the published figure from 2004 is based on simple analysis of the Health Professions Council of South Africa (HPCA) database, which includes every paid member on the register who lists a residential address in the Western Cape. Many doctors working overseas maintain their HPCSA registration using addresses of their relatives, while not actually working in the province, or even in the country. 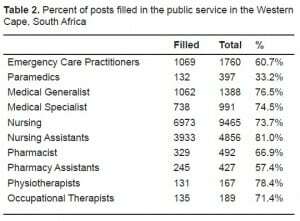 In addition, in 2008, a further 12,000 members, including physicians, dentists, occupational therapists, psychologists, optometrists, and emergency care practitioners were removed from the register36, often because they no longer practice in South Africa. Thus, the data collected in this study represent a more accurate assessment of the true numbers of staff available for immediate disaster surge capacity than the previously published HPCSA registration numbers. Disaster modelers have proposed that up to 20% of a hospital’s capacity can be augmented in the event of a disaster, by actions such as discharging patients awaiting elective surgery and low-risk medical and surgical patients in both in- and outpatient settings and calling in off-duty staff.44 The U.S. congressional review stated that this assumption would not be viable in U.S. healthcare facilities43 that already suffer from severe crowding on a daily basis. Similarities and dissimilarities exist in South Africa. There is a large indigent population as a result of a “quadruple burden of disease,” especially in the form of tuberculosis and HIV/AIDS, leaving many patients with Karnofsky indices of less than 50%.45 When this is considered collectively with an already overburdened emergency transport system, it leads to discharged patients occupying acute in-patient beds while awaiting pick-up. These patients often need ongoing basic nursing care while awaiting skilled nursing facility or home-based nursing care. The Gregorio Marañón University General Hospital in Madrid, an 1,800-bed facility, was only able to augment its bed capacity by 9% as a response to the influx of casualties following the 2004 bombings.42 A team that could initiate rapid discharges of stable patients, for example using the New York Rapid Discharge Tool, would facilitate a more efficient process.46 Such a team, able to coordinate a city-wide platform, is lacking in Cape Town. Additionally, real-time bed and personnel status data would not be available to itA U.S. Centers for Disease Control and Prevention analysis found that severely injured patients treated at hospitals with Level 1 trauma centers have a 25% lower risk of death than patients treated at a lower level or non-trauma center.47 While these data were not collected in the setting of a disaster, they may suggest that a Level 1 trauma unit would be the preferred destination for wounded in the event of a mass casualty incident involving trauma. There are only two adult Level 1 trauma units and one pediatric Level 1 unit in Cape Town. Fewer data exist for other capacity indicators like unoccupied intensive care unit (ICU) beds. Due to nursing shortages,48 it is unclear what percentage of the 128 ICU beds in the state are truly functional. To augment capacity, nurse:patient ratios may be shifted from 1:1 to 1:2. Real-time assessment of facilities, in view of ICU, high-care, burn and medical patient care capacity. Audit of available technical expertise in all fields (medical and paramedical) in state and private, culminating in the establishment of a medical reserve database. Individual hospitals require a situational awareness regarding the entire system. Rather than relying on an ad-hoc system of diversion reports or incident warnings, the Disaster Management Centre, in conjunction with the Emergency Medical Services, needs to seek out and establish a link with all registered healthcare institutions to determine actual and available staff. This should be legislated, implemented and kept current. Pre-event credentialing of state and private healthcare providers (e.g., doctors, nurses, pharmacists, physiotherapists, social workers, psychologists) must be in place and renewed and reviewed semi-annually or quarterly. This could be easily accomplished if the updating and registration of qualifications and skills would form part of a continuous medical education system and be included both in the databases of the Health Professions Council, as well as the public and private personnel databases. Long-term medical staff training, recruitment and retention strategies need to be revised, so that the state system becomes the preferred employer. Apart from attracting South African-trained medical practitioners, nurses and pharmacists to return to the country, it should also include a streamlined process for registering adequately trained foreign qualified practitioners. Concurrently, local systems need to be able to train more staff; this would involve retaining adequate specialist posts at all levels of care to attract junior healthcare providers for supervised training, as well as allowing for sufficient skilled personnel with dedicated time in teaching institutions for increased student numbers. Outsourced services such as laundry, security, catering and cleaning need to have disaster clauses in their Service Level Agreements that clearly define them as essential services and outline their roles in a declared disaster, including responsibilities for costs. Data extraction is a challenge in South Africa; there are no audits to verify the internal validity and completeness of the PERSAL dataset. A complete list of named individuals was available only for state institutions. In contrast, it was impossible to determine whether private healthcare workers were double counted, as the same detail was not available for this group. Furthermore, many of the data are not available in an easily usable format, or underlying competitiveness (private sector) or privacy and security concerns (public and private sector) limit access to data. The data that are available are limited in scope, with only certain types of personnel necessary for a comprehensive disaster response. For example, staff performing essential services, such as cleaning, catering and laundry services, are not recorded in a database since these services have been largely outsourced. This research was performed as a part of the thesis for the European Master in Disaster Medicine (EMDM). The author is indebted to his Supervisors, Prof Koenig and Prof Bey, who are faculty at the EMDM, as well as Drs E and T Visser for their assistance in this report. The author of this report, being an employee of the Provincial Government of the Western Cape, is responsible for its content. No statement in the report should be construed as an official position of the Provincial Government of the Western Cape. *What is termed “nursing sister” in South Africa refers to the only category of nursing staff that has gone to college and obtained a four-year degree. All the other categories of nursing staff undergo variable amounts of training, ranging from a home-based carrer who only receives a three month basic nursing care training course, to nursing assistant (one year), to staff and enrolled nurses (two years of training but via different routes – one via full-time training, one via on-the-job training with off-site teaching sessions and minor differences in scope of practice. This means that the numbers of “non-sisters” seem high but the competency and training levels are quite variable. 2. Committee on the Future of Emergency Care in the United States Health System Hospital-Based Emergency Care: At the Breaking Point. National Academic Press; 2007. The Evolving Role of Hospital-based Emergency Care; pp. 37–57. 3. Official FIFA™ Website 2006 FIFA World Cup™ broadcast wider, longer and farther than ever before. About FIFA: Organisation — Marketing Facts and Figures. Available at:http://www.fifa.com/aboutfifa/marketing/news/newsid=111247.html Accessed August 02, 2008. 4. Graef M. 2010 FIFA World Cup state of readiness. Disaster Management Indaba, 10 July 2008. Available at:http://www.ndmc.gov.za/comp/indaba%20pics/2010%20FIFA%20World%20Cup%20State%20of%20Readiness_Disaster%20Management%20Indaba.ppt Accessed July 15, 2008. 6. Calabro JJ, Rivera-Rivera EJ, Reich JJ, et al. Provision of emergency medical care for crowds. EMS Committee. American College of Emergency Physicians. Available at: www.acep.org Accessed July 02, 2008. 7. Molloy M, Sherif A, Natin S, et al. Management of Mass Gatherings. In: Koenig KL, Schultz C, editors. Koenig and Schultz’s Disaster Medicine: Comprehensive Principles and Practices. 1st ed. Cambridge University Press; 2009. 8. Arbon P, Bridgewater F, Smith C. Mass-gathering medicine: A predictive model for patient presentation rates. Prehosp Disaster Med. 2001;16:109–16. 9. National Treasury Systems – Persal Frequently Asked Questions, Department of Treasury of South Africa. Available at: www.treasury.fs.gov.za/faq.htm Accessed August 20, 2008. 10. WHO The World Health Report 2006: Working together for health World Health Organization; Geneva: 2006. Available at: http://www.who.int/whr/2006/en/ Accessed April 27, 2008. 12. Statistics South Africa Community survey 2007: municipal data on household services. Available at: http://www.statssa.gov.za/Publications/Report-03-01-21/Report-03-01-212007.pdfAccessed July 05, 2008. 13. Statistics South Africa Mid-year population estimates 2008, statistical release P0302. Available at: http://www.statssa.gov.za/publications/P0302/P03022008.pdf Accessed October 01, 2008. 14. Statistics South Africa Community Survey 2007 (revised version). Available at:http://www.statssa.gov.za/publications/P0301/P0301.pdf Accessed July 05, 2008. 15. Western Cape Provincial Treasury Migration Trends Western Cape Provincial Economic Review & Outlook 2005 2005. 140–145.145 Available at:http://www.capegateway.gov.za/Text/2005/3/pero_ch4.pdf Accessed July 05, 2008. 16. MacFarlane M. Examining the health of healthcare SAIRR Today The South African Institute of Race Relations, published online on August 22, 2008. Available at:http://www.raceleader.org.za/sairrtodaysairr-today-examining-the-health-of-healthcare-22-august-2008.html/?searchterm=private%20health%20care Accessed Oct 19, 2008. 17. Office of the Registrar of Medical Schemes Evaluation of medical schemes’ cost increases: findings and recommendations, Research Brief. 2008. 1 Available at:http://www.medicalschemes.com/publications/ZipPublications/Research%20Briefs/Report_on_Cost_Inc.pdf Accessed July 10, 2008. 18. WHO World Health Report 2000 World Health Organisation; Geneva, Switzerland: Available at:http://www.who.int/health-systemsperformance/whr2000.htm Accessed July 07, 2008. 19. UNDP Commitment to health: resources, access and services. Human Development Report 2007/2008 United Nations Development Programme; 2008. 248 Available at:http://hdr.undp.org/en/reports/global/hdr2007-2008/ Accessed July 05, 2008. 20. PGWC Leading 10 causes of premature mortality burden. Annual Performance Plan 2008/2009. Department of Health, Provincial Government of the Western Cape. 2008. 8. 21. Sanders D, Lloyd B. Human resources: international context. In: Barron P, Ijumba P, editors.South African Health Review 2005. Health Systems Trust; 2005. pp. 76–87. 22. Krajewski MJ, Sztajnkrycer M. Báez AA Hospital disaster preparedness in the United States: new issues, new challenges The Internet Journal of Rescue and Disaster Medicine 2007. 4 Available at:http://www.ispub.com/ostia/index.php?xmlFilePath=journals/ijrdm/vol4n2/preparedness.xml#e16 Accessed Oct 10, 2008. 23. Koordinierter Sanitätsdienst Einsatz der Armee im Rahmen der UEFA EURO 2008. Factsheet 10.04.2008. Eidgenössisches Departement für Verteidigung, Bevölkerungsschutz und Sport VBS, Schweizer Armee. Available at:http://www.vtg.admin.ch/internet/vtg/de/home/themen/einsaetze/laufende/EURO08.parsys.0633.downloadList.41889.DownloadFile.tmp/factsheetarmeeundeuro08d.pdf Accessed July 10, 2008. 24. Masinga S. Army too short-staffed to help. News24.com, media24 Digital, a NASPERS subsidiary. February142008. Available at: www.news24.com/News24/South_Africa/Politics/0,,2-7-12_2271052,00.html Accessed July 05, 2008. 25. Engelbrecht L. DA questions SANDF’s readiness. July 06, 2009 by DefenceWeb. Available at:http://www.defenceweb.co.za/index.php?option=com_content&task=view&id=2763&Itemid=379Accessed July 10, 2009. 26. DefenceWeb Fact file: Capabilities of the SA Military Health Service, published online on 26 November 2008 by DefenceWeb. Available at: http://www.defenceweb.co.za/index.php?option=com_content&task=view&id=777&Itemid=391 Accessed January 12, 2009. 27. FEMA Respond Mission: Medical Surge Target Capabilities List: A companion to the National Preparedness Guidelines US Department of Homeland Security, 2007. 449–464.464 Available at:https://www.llis.dhs.gov/docdetails/details.do?contentID=26724 Accessed July 16, 2008. 30. Steffen C, Masterson L, Christos S, et al. Willingness to respond: a survey of emergency department personnel and their predicted participation in mass casualty terrorist events. Ann Emerg Med. 2004;44:S34. 33. UNDP Commitment to health: resources, access and services. United Nations Development Report 2007/2008. United Nations Development Programme. 2007. 247–249.249 Available at:http://hdr.undp.org Accessed August 15, 2008. 34. Breier M, Wildschut A. Doctors in a Divided Society. Human Sciences Research Council; Cape Town, South Africa: 2008. The professional labour market and professional milieu for medical doctors in South Africa; pp. 9–21. 35. Hubedar H. South African Health Review 2005. Health Systems Trust; 2005. The nursing profession: production of nurses and proposed scope of practice; pp. 88–101. 37. Dhliwayo T. Healthcare Practitioners face erasure. HPCSA Newsroom. Health Professions Council of South Africa; 2008. Available at: http://www.hpcsa.co.za/hpcsa/default.aspx?type=News&news=489 Accessed October 12, 2008. 38. Duncan A. Submission to the South African Human Rights Commission. Faculty of Health Sciences, University of Cape Town; 2007. Available at:http://www.sahrc.org.za/sahrc_cms/downloads/CT%20University.ppt Accessed October 30, 2008. 39. PGWC Public Health personnel in 2006/2007. Annual Performance Plan 2008/2009. Department of Health, Provincial Government of the Western Cape; 2008. 49. 40. ICAO Aerodrome Operations Safety Management Manual 1st ed Doc 9859. International Civil Aviation Authority; 2006. 18-1–18-13.18-13. 44. US House of Representatives Hospital emergency surge capacity: not ready for the “predictable surprise.” Committee on Oversight and Government Reform, Majority Staff; 2008. Available at:http://oversight.house.gov/documents/20080505101837.pdf Accessed July 05, 2008. 45. Casani JAP, Romanosky AJ. Surge capacity. In: Ciottone GC, editor. Disaster Medicine. 3rd ed. Mosby Elsevier Publishing; 2006. pp. 193–202. 46. Ntuli A, Day C. South African Health Review 2003–2004. Health Systems Trust; 2005. Ten years on – Have we got what we ordered? pp. 1–10. 47. Continuum Health Partners Rapid patient discharge tool. The New York City Bioterrorism Hospital Preparedness Program, NYC Department of Health and Mental Hygiene; 2007. Available at:http://www.nyc.gov/html/doh/downloads/pdf/bhpp/hepp-hosps-rpdt-rev042308.pdf Accessed October 02, 2008. 49. PGWC Comprehensive service plan for the implementation of healthcare 2010. Provincial Government of the Western Cape. Available at:http://www.capegateway.gov.za/Text/2005/7/healthcare_2010_full.doc.pdf Accessed May 12, 2008. 50. Smith W. The South African Medical Resource Model (unpublished) — presented at theEmergency Medicine in the Developing World Congress in Cape Town, 24 November 2009.